NINEPIPES — The third annual Cultural Arts Fair will be held on the grounds of the Ninepipes Museum of Early Montana on Saturday, July 7, from 10 a.m.-4 p.m. This event brings together local artists and traditional skills demonstrators along with musicians and Nancy Vaughan’s Indian tacos and fry bread. A special feature inside the museum will be a reading and signing of a new book by Stevensville author and Stoneydale Press publisher, Dale Burk. 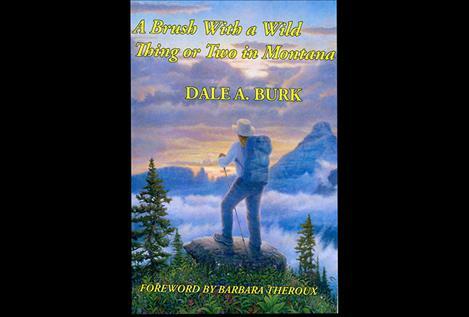 His book, “A Brush with a Wild Thing or Two in Montana,” shares many of Burk’s encounters or “brushes” with wild things and how they have shaped his work as a writer. At 11:30 a.m. Burk will conduct a presentation and reading in the museum’s diorama room and be on hand to sign books throughout the day in the gift shop’s art gallery by the fireplace. He will also give shorter readings at 1:30 and 2:30 p.m.
Burk is a third-generation Montanan who grew up in a logging family in northwestern Montana. Many people encouraged Burk to write this book, including longtime bookstore owner Barbara Theroux of Missoula, who states that this book “was to tell his story and tell it, it does. Dale is a storyteller so it should be no surprise that his memoir gives colorful insights into how wild places and things shaped his attitudes, writing and life … at age 12 he had his first piece published and he never looked back.” Over the course of his career, Burk has received numerous regional and national awards for his reporting on natural resource and conservation issues, and in 1975-76, he became the first Montana writer to win a prestigious Nieman Fellowship for Professional Journalists to Harvard University. Following ten years as a reporter, columnist and editor on the staff of The Missoulian, Burk continued to write books and freelance articles for various national publications and run, with his wife, Patricia, a regional book publishing firm out of Stevensville. The 200-page book includes many photographs to illustrate his stories which include “brushes” with wolverines, grizzly bears, lightning and mountain blizzards, colorful back country packers, camp cooks, hunters and fisherman such as Fran Johnson of Butte and the late Loren Kreck of Columbia Falls. Burk tells of his involvement in the effort to establish the Rocky Mountain Elk Foundation, and wraps up the books with a final chapter sharing his spiritual growth developed from his experiences in the Montana wilderness. The Cultural Arts Fair includes local artists such as photographer Larry Kjorvestad, book binder Donna Erickson, ceramic artist Lindy Johnston, beaders Susan Dodson Maas and Cat D’Len, and gourds by Lynn Fisher. The “First Saturday” featured artist is Joshua Marceau who will demonstrate his silversmithing and gemstone artistry. Traditional skill demonstrators include Don Safford, Frank Finley, Gary Steele, Nettie Cross, and Jan Kauffman. Come enjoy this fun-packed day at the museum and listen to live music and taste the delicious Indian tacos and fry bread offered up by Nancy Vaughan and her crew. This event is a fundraiser for the nonprofit Ninepipes Museum of Early Montana. Stop by and enjoy the museum between 9 a.m.-5 p.m. and browse through the museum’s unique gift shop. The museum is located at 69316 Highway 93, 6-miles south of Ronan, and is open Mondays-Saturdays. Call 406-644-3435 for information or to schedule a group tour.